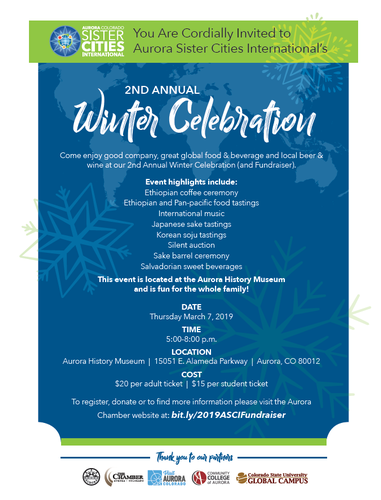 Come enjoy good company, global hors d' oeuvres, Japanese sake tasting, Korean soju samples, Salvadorian sweet beverages, Ethiopian coffee, a traditional sake barrel ceremony and bid on fantastic silent auction items! Silent auction items include: Colorado Nuggets tickets & parking, luxurious spa kits, electronics, hotel stays and much more! Aurora Sister Cities is a registered 501(c)3 non-profit organization and a portion of your ticket may be tax deductible. Additional donations are entirely tax deductible with our non-profit organization EIN 46-4347. Sorry. No refunds.